The German Maritime Search and Rescue Service (DGzRS) is rejuvenating its fleet with a 10-strong series of aluminium rescue craft newbuilds. 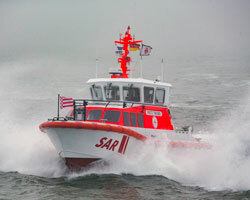 It is believed that the design for these boats was developed internally by DGzRS, which oversees a fleet of 20 search and rescue (SAR) cruisers and 40 SAR boats, and which can call on the services of 180 full-time and 800 qualified volunteer personnel. Each boat in the new series measures 10.1m x 3.6m – making it slightly larger than the 9.5m-long craft it is replacing – and draws just 960mm, thus facilitating launches in shallower waters, or coastal areas in the region prone to sandbanks and flax. Each new vessel is fitted with a single Cummins QSB6.7-M engine, rated 280kW at 3,000rpm, which powers a single propeller through a ZF286A gear and provides a speed of 20knots. These vessels also feature bollard pull capacities of 2.5tonnes apiece, enabling them to tow stricken small craft to safety, and feature medical facilities and portable pumps. Construction of the new series is being handled by two separate German yards. Tamsen Maritim, based in Rostock, delivered the first vessel, Fritz Thieme (pictured), in June and is now working its way through a further six sister boats. Meanwhile, Berne-based Fassmer will build the remaining three vessels in this class. The DGzRS reports that it conducted more than 2,000 sea and coastal rescue missions in 2017, resulting in 490 lives saved.